Fish care is something we take very seriously at Piscatorian and rightly so. We owe it to the carp to keep them in pristine condition and treating sores, cuts and ulcers with carp care treatment is of utmost importance. There are lots of products in the market, some are made for the fishing industry others for Koi keepers and also other products designed for human ulcers which can all be used to treat fish. I personally have never been that happy with the many of the products designed for the angling market as they seem to easily wash off on contact with water so I have used Orabase designed for human mouth ulcers which seemed to stick to the wound much better. When I heard about Korda Propolis carp care treatment it sounded just the ticket as it creates a waterproof barrier which seals the wound. Used in the Koi industry to treat wounds on the fishes body, mouth, ulcers or damaged fins with a waxy outer coat to help prevent pathogens or debris from entering the wound. Propolis contains antimicrobial properties and is a natural product produced by bees to protect themselves against infection. 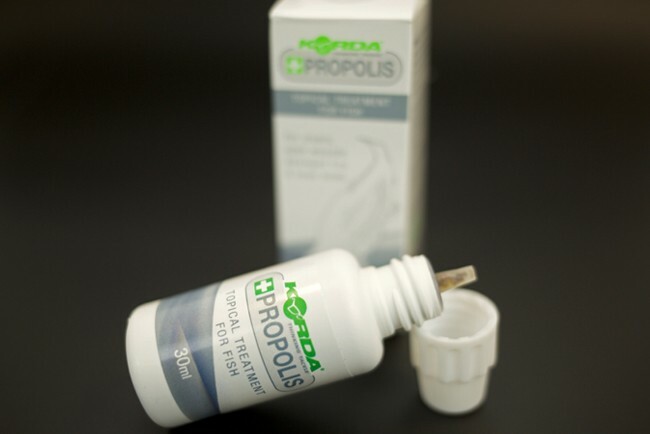 We will be giving this product a through test over the coming year, give Korda Propolis a try yourself you owe it to the fish.